I've realized Friday isn't the best day for me to do these because I'm always busy all day, but I love alliteration more than I love being logical, I guess! I'll continue these installments even if I write them a bit irregularly. On this week's Fantasy Friday, I'm discussing the Pathfinder universe. It's a fantasy role-playing game, much like Dungeons and Dragons, but I don't actually play it! I'd love to rectify that in the future. Right now, though, I don't have much free time to delve into it. And because I didn't play it, I always stayed away from that part of the sci-fi/fantasy section in the bookstore. I was missing out! Before one of my besties moved to England, she and I would spend lots of time browsing the local B&N. The last time we went together, I stumped one of the booksellers. My friend wanted sci-fi about AI, and his first suggestion was successful. Then I asked for epic or high fantasy with prominent female characters, and he had to try four different suggestions and leave and come back in order to get me to Pathfinder. Out of the series shelf, he pulled out a few titles and explained what they were about. I walked out with three Pathfinder books that day. 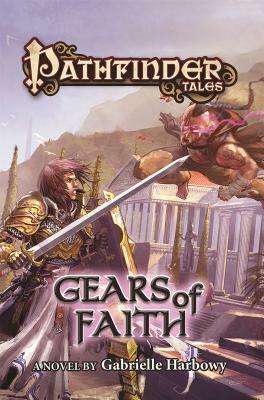 The first I read was Gears of Faith by Gabrielle Harbowy. It followa Keren, a knight of Iomedae, and her girlfriend, Zae, a gnome cleric of the clockwork god. When they move to the city of Absalom, they both face challenges in adapting to their new lives while searching for a stolen bloodstone. Even though I'd never read anything in the Pathfinder universe, I never felt lost. Harbowy explained enough to keep me knowledgeable but not so much that I lost interest. I read it in a few days because it turned out to be exactly what I wanted to read. I loved that there were two female protagonists who were very different but relied on each other for strength and comfort. It was great to see fantasy with LGBT+ representation--and in more than one way. Most of all, in this age of gritty, grimdark sprawling series, I enjoyed the chance to read a standalone fantasy that had nice, moral characters at its heart. I'm so, so tired of fantasy books that focus on characters betraying each other in the name of ambition. So, yeah, the recommendation of Gears of Faith was a resounding success. 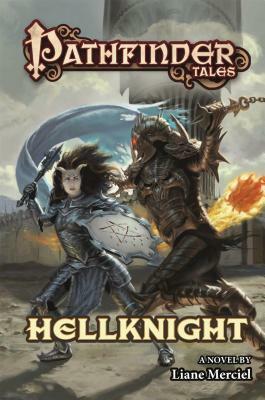 I've started reading another book in the series, Hellknight by Liane Merciel. This one is taking me longer not because I don't like it but because I'm a slow reader who reads too many books at once. It's about Jheraal, a Hellknight, one of a brutal organization of warriors dedicated to maintaining law and order at any cost. She teams up with a knight named Ederras to stop a serial killer who targets children. Although I'm only 1/4 of the way in, I'm looking forward to reading more this weekend and, once I've finished, diving into other Pathfinder adventures.